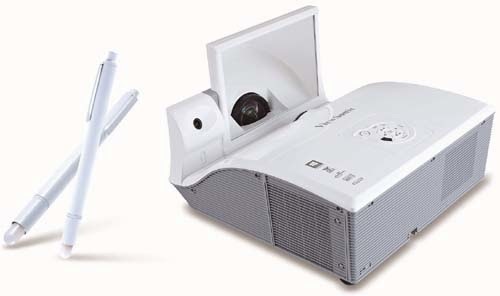 ViewSonic debuts two ultra short throw projector aimed at education market the WXGA PJD8653ws and XGA PJD8353s. This new ultra short throw series are packed with 3000 lumens brightness, and 15,000:1 contrast ratio to deliver sharp images. With an ultra short throw lens, the projectors are allowed to be mounted right above a whiteboard or screen without creating hot spots, shadows or casting bright light in front of the presenter, making it perfect for smaller or difficult projection spaces like classrooms. "Technology in education has played a significant role in educating and connecting the students to the existing and future learning opportunities,” said Vincent Hung, product manager for ViewSonic. "Foreseeing the trend of interactive teaching environment in diverse of education environments, ViewSonic is dedicated to providing solutions for the Educational Projector Market. We believe the demand for ultra short throw projection and interactive learning will keep growing stably and will keep putting efforts to provide solutions for education segment. " With the optional interactive package (PJ-PEN-003), the PJD8653ws and PJD8353s become interactive projectors that transform any surface into an interactive whiteboard. Along with the ViewDraw 2 software, the dual interactive pens allow 2 users to simultaneously annotate, write, or draw, on the projected image. Utilizing reflective mirror technology, the PJD8653ws and PJD8353s can be mounted above an interactive white board or wall for the projection of an image up to 110”. Equipped with a Crestron® LAN controller, the projectors make it easy for IT administrators to remotely control and manage multiple projectors from their workstations, while AMX® Device Discovery™ certification allows for easy integration. Equipped with the latest HDMI, ViewSonic's PJD8653ws and PJD8353s can display 3D images directly from 3D Blu-ray® players and deliver the highest picture and sound quality without degradation — perfect for connecting to any HDMI-enabled devices such as PCs, laptops, tablets, and media players. 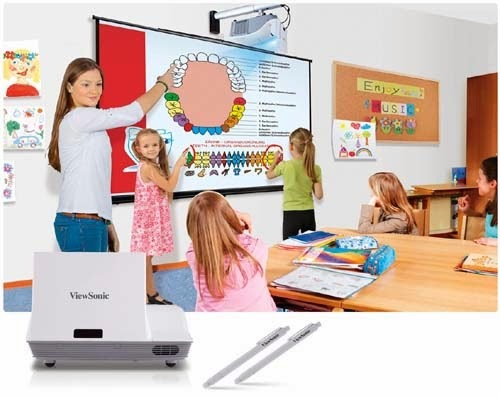 ViewSonic’s continued dedication into developing new technology helps teachers to lead effective lectures and discussion. The projectors promote teacher-student interaction and class participation and become an important element in interactive education. *Disclosure: An important note, we are just sharing this information to the public, provided by our source (Image Media Phils). ViewSonic Info / Logos / Photos / Images have respective copyrights. how much it is? available na ba? hi there, i what to know more about the product, actually im a teacher, this would be beneficial in teaching needs.